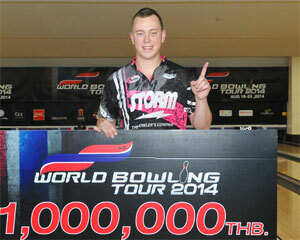 25th August, Bangkok: Third-seed, Osku Palermaa of Finland defeated top seed, Ryan Ciminelli of USA twice in the final match of the 2014 PBA-WBT #12 World Bowling Tour Thailand to win his fourth PBA title. Ciminelli of Cheektowaga, N.Y., had started the first match with three strikes-in-a-row for a 10 pin lead over challenger Palermaa but a split in the fourth frame allowed the two-handed Finn to draw level. Both rolled a double in the seventh and eight frames but Palermaa had an upper hand with a third in the ninth frame to take the match, 227-213 and forced a second deciding match. Again Ciminelli got off to a better start with a double and two marked frames as his opponent followed by marking the first four frames. Palermaa then set the lanes on fire as he reeled in six strikes-in-a-row while the American was unable to respond. 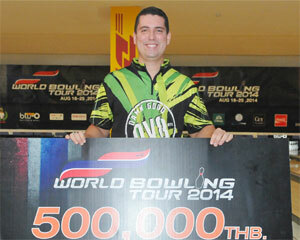 Palermaa went on to seal the match and win the title, 243-224 to pocket the top prize of 1 million Thai Baht (approx. US$32,350). Ciminelli settled for 500,000 Baht (approx. US$12,120). "I hadn't used the urethane ball in the past few days but I started to use it today in the earlier Round 4 finals," said the 30-year-old champion, who owned two PBA titles which he won in 2010 and 2012 and the 2011-12 PBA Championship. "I was very comfortable with the ball and when I saw Ryan was struggling, I knew I had a good chance to win." Palermaa earned a crack at the title after he dispatched second-seed, Naif Oqab of UAE, 234-191 in the semi-finals. Palermaa also beat Round 3 leader, Suh Sang Cheon of Korea 224-206 in the quarter-finals. Suh had earlier ousted compatriot and fifth-seed Kim Byoung Suk and winner of the first match, Dominic Barrett of England, 234-217-204. The Brit, who was seeded No. 6, defeated seventh-seed, Jason Sterner of USA and top Thai, Dechochai Tinjiratip, 257-235-218 to move into the next match. In this morning's Round 4 finals, Ciminelli earned top spot with 1466. Oqab, who shot his second 300 and the tournament's third, finished second with 1343 ahead of Palermaa in third with 1322. Suh, Kim and Barrett took fourth to sixth positions with 1305, 1291 and 1268 respectively. Sterner clinched seventh position with 1264 edging compatriot Marshall Kent by 1 pin. Dechochai was awarded eighth for the TV finals as the top Thai, who finished 12th with 1216. 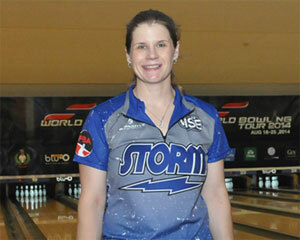 102 bowlers participated in the final stop of this year's PBA-World Bowling Tour season. Mika Koivuniemi of Finland topped the rankings with 567 points followed by Sean Rash of USA in second with 549. Jason Belmonte of Australia finished third with 538. In the women's division, Kelly Kulick of USA sealed top post by extending her total to 718 points. Liz Johnson of USA took second spot with 459 as Sandra Andersson improved to 410 to finish third. The top 3 in the rankings qualified for the World Bowling Tour Grand Finals. The World Bowling, which is made up of more than 110 bowling federations, governs the sport throughout the world. For more information on World Bowling and the World Bowling Tour, visit www.worldbowling.org. 24th August, Bangkok: Koreans dominated Round 3 finals of the 2014 PBA-WBT #12 World Bowling Tour Thailand at Blu-O Paragon on Sunday evening with Suh Sang Cheon, Gu Yong Jin and Cho Young Seon occupying the top 3 positions. Korean pro, Kim Young Kwan set a cracking pace with a stunning 280 to lead compatriot Suh Sang Cheon by 7 pins and a third Korean and 2012 champion, Cho Young Seon a further 35 pins away in third. But Cho surged ahead of Kim by just 1 pin after the 2013 World Championship Masters gold medalist followed it up with a superb 257 in the second game while American Jason Sterner move up to third. Cho stretched his lead to 24 pins at the halfway mark as Kim managed only 170 to slip down to fifth and Suh reclaimed second spot after recovering with 253. Sterner was the only non-Korean to keep pace with the leading duo. The Korean duo continued to set the pace after the fourth game with Cho still holding on to the lead albeit only 10 pins ahead of Suh. Cho suffered a slight setback with 194 in the fifth to hand the lead to Suh, who posted 229. 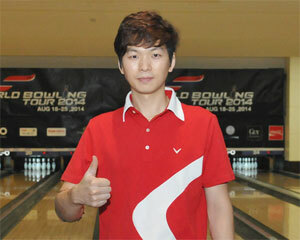 Korean pro, Gu Yong Jin rolled several strong games to take over second spot and was just trailing by 24 pins. Suh eased off with 221 in the sixth and final game to win the round with 1407. Gu also ended strongly again with 225 to claim second spot with 1387 while Cho settled for third position with 1378. Last year's first runner-up, Mika Koivuniemi of Finland stormed home to finish fourth with 1368. Malaysian youngster, Noor Afizal Azizan surprised the field to complete the top 5 with 1352. The top female finisher was Korean PBA pro, Han Sol who took sixth position with 1326. Two Brits, Stuart Williams and Dominic Barrett advanced into the next round in seventh and 11th joined by Marshall Kent, Jason Sterner and Danielle McEwan in eighth, ninth and 12th positions respectively. A fourth Korean, Kim Byoung Suk finished tenth while 2012 first runner-up, Chris Barnes finished in the unlucky 13 and missing the cut by just 1 pin. Round 2 winner, Kelly Kulick also failed to advance ending in 19th. The top 12 will be joined by the 8 seeded qualifiers for another 6 games scratch. The top 7 plus the top Thai outside the seven will proceed to the TV Final Shootout Round. 24th August, Bangkok: Current WBT Women Ranked No. 1 and debutant, Kelly Kulick of United States took a comfortable win in Round 2 finals of the 2014 PBA-WBT #12 World Bowling Tour Thailand to advance into the next round. Kulick, the 2010 World Bowling Writers Women Bowler of the Year, got off the block brilliantly with 224 to lead 2013 ABF Tour TOC winner, Surasak Manuwong thanks to an 8-pin handicap she received bowling against the men. The 37-year-old American from Union, N.J. lost the lead briefly after the second game to 2011 ABF Tour Thailand women champion, Yanne Saebae of Thailand, who rolled 254 following her 191 opening game. Indonesian Ryan Lalisang trailed the Thai after knocking down 263 as Kulick slipped down to third. But Kulick bounced back with 218 in the third game to regain the lead as Singapore's Bernice Lim took over second spot. With back-to-back 257 in the fourth and fifth games, Kulick had already built up a sizeable lead of 77 pins to her nearest rival. Thai national, Atittarat Cheng posted two big games of 255 and 243 to take second spot. The leader cruised home with 207 to win the round with 1415, 124 pins ahead of Lalisang in second with 1291. Cheng settled for third with 1278 ahead of Korean pro, Han Sol in fourth with 1260. Lim and Saebae finished fifth and sixth positions with 1258 and 1228 while Kang Bo Long of Malaysia finished seventh with 1227. Two additional Korean pro, Gu Yong Jin and Kim Young Kwan took eighth and ninth spots with 1224 and 1215 respectively. Early pace-setter, Manuwong clinched the tenth and final spot to advance into the next round with 1199. 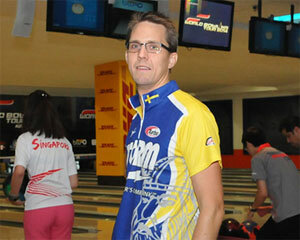 This year's Thailand Open champion, Kim Bolleby of Sweden missed the cut by 5 pins to finish 11th. The top 10 will join qualifiers position ninth to 24th for another 6 games from scratch with the top 12 finishers advancing to Round 4 finals the next day. 23rd August, Bangkok: 2013 World Championships Team gold medalist, Osku Palermaa of Finland took over the lead of the 2014 PBA-WBT #12 World Bowling Tour Thailand qualifying standings at Blu-O Paragon Bowling Centre on Saturday. Palermaa, who was tenth last night, notched up 735 and 704 to add to his best 3-game series of 715 for a new 9-game total of 2154 for the lead. Defending champion, Sean Rash of United States, who was fourth earlier with 2116, came in second with an improved 2153 total. Overnight leader and perfect gamer, Naif Oqab of UAE slipped down to third after leading for the past three days with 2151. 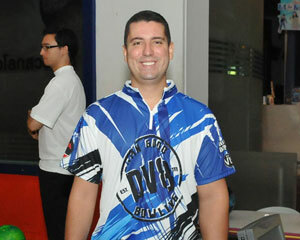 American PBA pro, Mike Fagan had moved into second earlier, settled for fourth with 2147. Three-times TV finalist, Ryan Ciminelli of USA took fifth position with 2146 while top local national bowler, Yannaphon Larpapharat regained sixth position with 2138 after slipping out of the top 7. Martin Larsen of Sweden, who was second yesterday, also slipped down to occupy seventh and final top bracket spot with 2137. Dechochai Tinjiratip claimed eighth and top local qualifying spot for ROund 4 finals with 2114. 2012 Thai Masters champion, Phumin Klanbida earned the top local qualifier outside the top 8 to lead qualifiers positioned 10 to 24 for Round 3 finals. 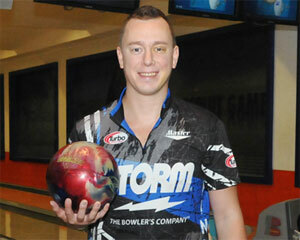 Debutant, Jason Sterner of USA finished tenth with 2134 missing the top bracket by 3 pins. The cut for the second bracket went to Bernice Lim of Singapore with 2056 as this year's Thailand Open champion, Kim Billeby of Sweden headed the third bracket in 25th position with 2054.
Notable top PBA pros, Chris Barnes of USA (13th-2087), Stuart Williams of England (14th-2086), Matthew Gasn of USA (15th-2079, Dominic Barrett of England (16th-2076), Jeong Tae Hwa of Korea (17th-2076), John Janawicz of USA (18th-2073) and Kelly Kulick of USA (21st-2062) made Round 3 finals. The cut for Round 2 finals went to 2014 Bahrain Open champion, Shaker Al Hassan of UAE with 2014. Current WBT Ranking leader, Mika Koivuniemi of Finland managed only 27th position. Surasak Manuwong and Yanee Saebae claimed the last two slots 38th and 39th reserved for local qualifiers. With three more squad left to play, it appeared that the cut for Round 2 finals could be as much as 2030 while the cut for Round 3 could be 2060. The cut for the top bracket could stand at 2140. 15 qualifiers positioned 25 to 39 plus top 3 from desperado squad will contest ROund 2 finals over 6 games tomorrow at 1.00pm local time. The top 10 finishers will be joined by qualifiers positioned 9 to 24 for another 6 games from scratch at 7.00pm. The top 12 at the end of Round 3 will join the 8 seeded qualifiers from the top bracket for a final 6 games in Round 4 finals from scratch on August 25 at 10.00am. The top 7 plus top local bowler will then advance to the TV Shootout Finals at 2.00pm. 22nd August, Bangkok: Martin Larsen of Sweden lead two American PBA pros, Ryan Ciminelli and Mathew Gasn to crack into the top barcket of the qualifying standings at the 2014 PBA-WBT #12 World Bowling Tour Thailand on Friday. Larsen, who won the #9 EBT stop at the Brunswick Madrid Challenge, registered three 700-series of 717, 716 and 704 to leapfrog into second in the standings with 2137, just 14 pins behind leader, Naif Oqab of UAE with 2151. The Swede, who has yet to win his first World Bolwing Tour title, will be one of the top title contenders based on his current form. 2012 champion, Cho Young Seon of Korea slipped down to third with 2112. Three-times TV finalist, Ryan Ciminelli of USA joined Larsen today in the top bracket after improving his lowest 3-game series of 641 with 704 to tie with Yannaphon Larpapharat of Thailand in fourth with 2108. 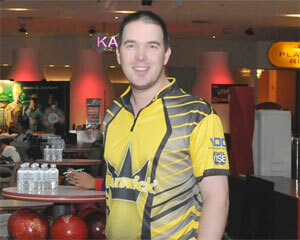 Tour debutant, Matthew Gasn made up the trio to make the top bracket after the American pro totaled 2079. 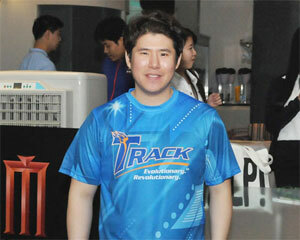 KPBA's Kim Byoung Suk of Korea occupied the seventh and final spot with 2072. Dechochai Tinjiratip claimed the highest Thai and eighth position for Round 4 finals with 2070. This year's Thailand Open women champion, Angkana Netrviseth of Thailand earn one bye for Round 3 finals after she took up the top local qualifier in ninth position with 2057. A second KPBA pro, Gu Yong Jin, who was in the top bracket, got knocked out into 10th position to head the second bracket qualifiers with 2069. The cut for the second bracket went to Kim Young Kwan of Korea with 1999. Stuart Williams of England headed the third bracket in 25th position with 1996 while the cut at 37th position went to ex-international, Kang Bo Long of Malaysia with 1959. With one more qualifying day left before the finals on August 24, the cut for the third bracket could go up to as much as 2000-2010 while the cut for the second bracket to be in the region of 2030-2040. Peerawich Rungcharoen and Panuruj Vilailak completed positions 38 and 39 as local qualifiers for Round 2 finals. Several top competitors, who have yet to make the cut are 2012 first runner-up, Chris Barnes of USA. Also missing were 2013 ABF Tour TOC winner, Surasak Manuwong of Thailand. 2013 World Championships Team silver medalist, John Janawicz of USA, Jason Sterner and Mike Fagan of USA have yet to complete 9 games. 21st August, Bangkok: PBA Tournament of Champion winner, Sean Rash of United States moved into the top bracket of the qualifying standings at the PBA-WBT #12 World Bowling Tour Thailand in his bid to defend the title he won last year. Rash of Montgomery, Ill., was 11th with 2022, notched up a slightly improved 672 to take his 9-game tally to 2060 and moved into fifth. Any more improvement will easily move the American into top spot. Another qualifier making his presence felt was Korean pro, Gu Yong Jin, who leapfrog into fourth position with 2069. Perfect gamer, Naif Oqab of UAE continued to lead the field with 2151 followed by 2012 champion, Cho Young Seon of Korea in second with 2109. Top local title contender and 2012 ABF Tour TOC winner, Yannaphon Larpapharat sat comfortably in third with 2018. Making up the top 7 was another Korean pro, Kim Byoung Suk in sixth with 2057 while this year's Thailand Open women champion and top women, Angkana Netrvieth of Thailand claimed the seventh spot with 2057. Last year's Thailand Masters champion, Phumin Klanbida of Thailand clinched the top local qualifier position for Round 4 finals in eighth position with 2056. Annop Arromsaranon took ninth position with 1991 to become the top local qualifier for Round 3 finals while three-times TV finalist, Ryan Ciminelli of USA missed the top bracket cut by 11 pins to head the second bracket with 2045. The cut for the second bracket in 24th position went to Atittarat Cheng of Thailand with 1932 as Tanaprang Sathean of Thailand finished 25th to head the third bracket with 1930. The qualifying cut at 37th position is held by Sultan Mohamed Al Qubaisi of UAE with 1874. Sithphol Kunaksorn and Lapasdanai Chusaeng occupied positions 38 and 39 reserved for local qualifiers. Last year's cut was at 2011 or averaging 223.44. Qualifying will continue for another two days. Round 2 and Round 3 finals will be contested on August 24 and Round 4 finals on August 25. The champion will take home the top prize of 1 million Thai baht (approx. US$32,258) with the first and second runner-ups, 500,000 and 300,000 baht respectively. Winners will also be award World Bowling Tour ranking points. 20th August, Bangkok: 2012 ABF Tour TOC winner, Yannaphon Larpapharat is eyeing his first tour title after taking up third spot in the qualifying standings of the 2014 PBA-WBT #2 World Bowling Tour Thailand on Wednesday. The 32-year-old Thai national bowler, who had set the early qualifying pace last year before squeezing into Round 4 finals as the top local qualifier, missed the cut for the TV finals in 12th position. Yannaphon again set the qualifying pace to lead the first two days before settling for third after Naif Oqab of UAE moved into the lead with 2151 after rolling the tournament's first perfect game. 2012 champion and 2013 World Championships Masters gold medalist, Cho Young Seon of Korea improved to take up second in the table with 2109 leaving Yannaphon in third with 2108. Current WBT ranking leader, Mika Koivuniemi of Finland finished fourth with 2031. This year's Thailand Open champion, Kim Bolleby of Sweden moved up into fifth with 2018 ahead of 2012 Thailand Masters champion, Phumin Klanbida of Thailand and Annop Arromsaranon making up the top 7 with 1992 and 1991 respectively. 2011 ABF Tour Thailand champion, Yanne Saebae made Round 4 finals as the top local qualifier with 1987. Thai youngster, Atittarat Cheng missed the top bracket in ninth to earn one bye for Round 3 finals with 1932. 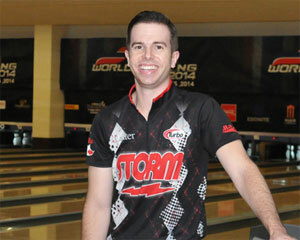 PBA pro Ryan Ciminelli of USA headed the second bracket with 1985 in tenth to lead the next 15 qualifiers for Round 3 finals. Peerawich Rungcharoen of Thailand headed the third bracket with 1891 in 25th position while the current cut in 37th position went to Korngunya Aree of Thailand with 1753. Positions 38 and 39 are reserved for two highest local qualifier not in above three brackets for Round 2 finals. 15 bowlers positioned 25 to 39 plus three from desperado squad will contest Round 2 finals over 6 games which will be cut to 10 to join 16 bowlers positioned 9 to 24 for another 6 games in Round 3 finals. The top 12 finishers will join the top 8 qualifiers for a final 6 games in Round 4 finals after which the top 7 plus the top local will advance to the TV Shootout finals. 19th August, Bangkok: Naif Oqab of United Arab Emirates shot the tournament's first perfect game en-route to taking over the lead of the qualifying standings at the 2014 PBA-WBT #12 World Bowling Tour Thailand underway at Blu-O Paragon. Naif, who was second to top local title contender, Yannaphon Larpapharat of Thailand, rolled the tournament's first 300 to improve his lowest 3-game series of 641 to 718. Adding his lastest effort to his other two series of 746 and 687 moved him into the lead of the qualifying standings with 2151. 2012 champion, Cho Young Seon who registered 667 in his first attempt, added 730 and 712 for a 9-game tally of 2109 to take up second in the standings pushing overnight leader, Yannaphon into third with 2081. Last year's runner-up and current WBT Ranking leader, Mika Koivuniemi of Finland finished fourth with 2031 followed by the top female qualifier and 2011 ABF Tour Thailand champion, Yanee Saebae of Thailand with 1987. Annop Arromsarason of Thailand completed the top 7 with 1952. Thai youth, Atittarat Cheng held the top local qualifer in eighth position with 1932. The top 8 will earn a bye and qualify automatically for Round 4 Finals. Dechochai Tinjiratip of Thailand is the top local qualifier with 1929 to lead the next 15 qualifiers positioned 10th to 24th into Round 3 Finals while qualifiers positioned 25th to 37th will battle the Round 2 Finals. Positions 38 and 39 are reserved for local qualifiers and will include the top 3 qualifiers from the one-game desperado squad. Qualifiying will run through to August 23 with the finals starting from August 24. Copyright © 2011-2014. All Rights Reserved. Thai Tenpin Bowling Association.